Al Gore's climate change/global warming documentary, "An Inconvenient Sequel," had an inconvenient weekend---so did Mr. Gore. The film, unlike his first that was #1 at the box office opening weekend, did not rise above #15 this past weekend in its premier. Some of the activist organizations will ramp up in an effort to save Gore and "the cause," but it appears Gore and his disciples see the handwriting on the wall. They are blaming Hollywood (Paramount Pictures) and right wing inspired apathy for the failure. But there is something more and different and bigger going on. In a word, I think an epidemic of commonsense has struck the public. Climate Depot says Gore fans have been reduced to blaming the distributor, calling it a "botched strategy by Paramount Pictures" which "effectively sabotaged the nationwide release of Gore's sequel." The film barely broke the million dollar mark in total revenue, placing it at #15 in the theaters. A profound disappointment for Gore in that he had traveled the country promoting the film, urging fans, "By filling the theaters, we can show Donald Trump and the other climate deniers in the White House that the American people are committed to climate action---no matter what they do or say or tweet!" Perhaps the "American people" don't agree with Gore. The Washington Monthly says, "Sadly, the box office under-performance of An Inconvenient Sequel will be seized upon by climate-change deniers as 'proof' that Americans don't really care about the issue." We do care, but have a different solution. It's difficult to believe that Hollywood would purposefully sabotage anything that is as far Left as Al Gore and his climate claims. But they might push away over money---or the possibility of loosing some. Maybe Hollywood has discerned Gore's message more correctly than his own followers have been able to do. 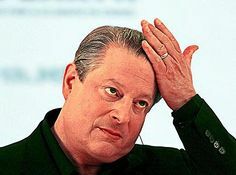 Extreme weather expert Dr. Roger Pielke Jr. says actual data shows that many of Gore's claims have failed to materialize and in fact, his assertions have been exactly the opposite of what has happened. False prophets were stoned in the old days---now we simply ignore them. Dr. Robert Giegengack, who chaired the Department of Earth and Science at the University of Pennsylvania and voted for Al Gore in the past, said this after viewing Gore's film: "I was appalled because he either deliberately misrepresented the point he was making or didn't understand it. So it was irresponsible of Al Gore." He says, "CO2 is not the villain that it has been portrayed. I'm impressed by the fact that the present climate, from the perspective of a geologist, is very close to the coldest it's ever been. The concentration of CO2 in the atmosphere today is close to the lowest it has ever been." Many other scientists and geologists agree but have been silenced by the manipulating of grant money away from them or the activist science community simply refusing to report their findings---or both. There is much more information in the Climate Depot article linked above. An abundance of information and data exists to lead people to believe that Al Gore's "climate hustle" is just that. He has personally made hundreds of millions of dollars off his climate agenda. And in exploiting nature and climate Gore has, perhaps inadvertently, caused millions of people to take an honest look at "all" the data, not just Gore's data. And an epidemic of commonsense has flooded the people, while Gore's rising oceans haven't risen as predicted. Last week President Trump kept another campaign promise to the American people by confirming that America will, in fact, remove ourselves from the Paris Accord, but will pursue reasonable, responsible and common sense acts of stewardship regarding the earth. In a Seattle Times' article yesterday, they were declaring that "Some parts of Washington State, like Walla Walla County, could see dozens more 95-degree days if only modest action is taken on climate change..."
The Times characterized the climate hustle movement with these opening words: "As an apocalyptic haze blanketed Seattle last week, temperatures soared into the 90's and left Seattleites ruing their lack of air conditioning." Then they dove into the deep end of the pool. Question: "How hot will it get?" Answer: "A consortium of researchers"..."have analyzed two consensus climate models and projected changes nationwide"..."scientists project climate change will exacerbate wildfire activity. Extremely hot days---95 degrees and above---are expected to be more common." The Seattle Times article includes a map of Washington State counties and the predicted change in temperatures if we only take modest actions verses the extreme actions activists like Gore are demanding. One of the model's scenarios show Walla Walla County with between 56 and 86 extremely hot days between 2080 and 2099, and Yakima County, "Washington State's cornucopia of produce" with 47 to 80 extremely hot days. The Times says, currently Walla Walla historically has 18 such days and Yakima has 11. In my growing up days in the Yakima Valley---working in the orchard--- my memory is that we were already having about 100 such days. Progressivism is a destructive, regressive descent into the lowest and least. It careens from pillar to post without absolute Truth for guidance---most often becoming the preferred self-serving tool of the misled---always undermining the common good it claims to serve. There is a fresh breeze of commonsense blowing across our culture that is scouring out the fog and haze of multiculturalism and political correctness---and nonsense. In this spirit of stewardship of Creation, rather than worship of it, Reps. Mike Johnson, R-LA., and Paul Gosar, R-Ariz., are leading an effort to do away with endangered species regulations that are hurting farmers and ranchers without benefiting the targeted wildlife. Obscure critters like snail darters and Gunnison sage grouse are shutting down farms, while wolves are killing the rancher's livestock---with no positive impact on the "endangered or targeted species." In fact of the 1,652 species of animals and plants on the endangered or threatened list in the US since the law was passed in 1973, only 47 species have been delisted due to recovery of the species. Of those species who are recovering, the endangered act or animal relocation activities are now causing Fish and Wildlife to be forced to shoot wolves on Northeast Washington ranches to save the ranchers businesses. Senator John Barrasso, R-Wyo. who supports the effort is an orthopedic surgeon. He says, "As a doctor if I admit 100 patients to the hospital and only 3 recover enough under my treatment to be discharged, I would deserve to lose my medical license." A return to commonsense is a return to the mandate of the Creator--Genesis 1:26-28. Man-made CO2 global warming is the biggest con-job in the history of the world. Perhaps clarity and truth can now serve as an example of how dishonest politicians and special interests can cause millions of honest citizens to fearfully embrace a lie and angrily come against their fellow man to force feed that lie to those who know the truth. To expose this scenario world-wide could be an eye-opener to our failing secular leftist world. If one simply takes the percentage of all global warming that is caused by Greenhouse gasses, then multiply that by the percentage of all greenhouse gasses represented by CO2, then multiply that percentage against the percentage of CO2 than comes from mans activities (fossil fuels)....the resulting figure is so tiny it clear that eliminating fossil fuels completely would not remove enough "CO2 warming influence” to make any difference, but it would destroy hundreds of millions of human lives and cut the life span of the others by 50% or more. The ultra wealthy manipulators would, however; survive..